Technical Diving Instructor Trainer/PADI Course Director. Jonas is a technical instructor trainer, with a record depth of 185 meters, and loves to explore deep caves and wrecks all around the world. 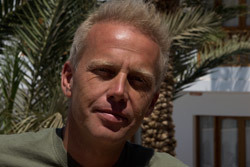 Jonas moved to Dahab, Egypt in 2010 to be part of the foundation of Team Blue Immersion Tech which specialize in Tech Diving, Deep U/W Photo and Diving Expeditions. Prior to moving to the Red Sea Jonas lived in Thailand where he worked as an operational manager and instructor trainer while building the largest diving center in the world with over 70 full-time instructors employed. He created innovative programs like “Change of Lifestyle” which became a world wide adapted program for divers seeking a career in diving. During his period in Thailand Jonas fostered and mentored over 20 Master Instructor to become Course Directors. Jonas, while being Operational Manager, got awarded for operating the fastest growing dive center in the world by achieving over 100.000 diver certification in less than 20 years – the first dive center to reach that goal in the history of diving to this date. In 2010 Jonas joined the prestigious Fourth Element Dive team and during the last year Team Blue Immersion and Fourth Element have teamed up on several occasions exploring dive sites around the world. Jonas is also a test diver for JS Watch Co and MOD Lights. Jonas Samuelsson and his friend and collegue freediver Akim Adhari are the founders of Blue Immersion which is a team of the world’s leading freedivers and technical divers. Blue Immersion’s Technical Diving Section is operated in partnership with Erik Brown (Trimix Instructor/Photographer) and Aron Daniel Arngrimsson (Technical Instructor/Videographer).